Luis Collazo vs. Sammy Vasquez Jr.
Will we finally see a Kell Brook vs. Errol Spence Jr. showdown. Chad Dawson vs. Andrzej Fonfara added to Garcia vs. Thurman card. Claressa Shields set to make some history for Womens’s boxing. – Francisco Vargas v. Orlando Salido more than lived up to expectations as they waged war last Saturday night at the StubHub. What’s in the future for both, and how soon can we get a rematch? – Did Abraham Lopez REALLY deserve the decision over Julian Ramirez? – Liam Smith made easy work of Pedrag Radosevic, is a bout versus Canelo Alvarez possibly on the horizon? – Artur Beterbiev makes mincemeat of Ezequiel Maderna. – Rances Barthelemy outpoints Mickey Bey. Now it’s onward and upward for Barthelemy… to Jr. Welterweight. – Deontay Wilder to fight Chris Arreola in July. – Deontay Wilder stops Eric Molina in nine rounds. 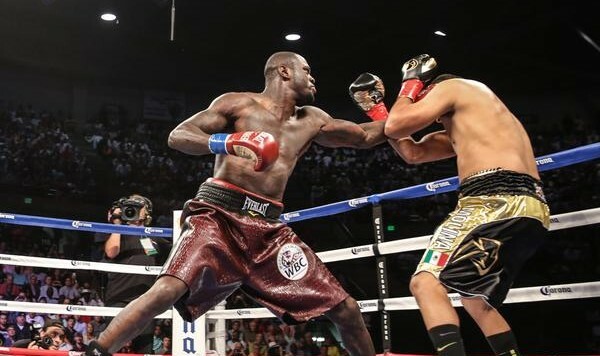 We discuss Wilder’s performance, and why he there’s plenty of room for improvement. – Nicholas Walters put on a solid performance against Miguel Marriaga. The question in the aftermath, is Walter a Featherweight or his he outgrowing the decision? – Felix Verdejo scores and exciting win over Ivan Najera. Is Verdejo and emerging star in the sport. – Sergio Martinez announces his retirement, we discuss his career.